Our aim is to create intelligent and engaging content through news, analysis, comment, profiles, debate, specialist reports, the Pioneers Post Business School and our own online TV and podcast channels. 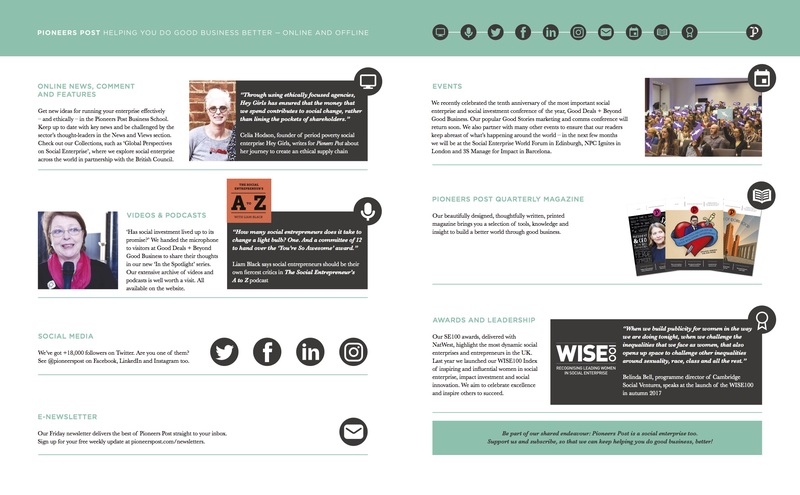 Pioneers Post is itself a social enterprise, with clear social aims and profits ploughed back to support our community of socially progressive readers. We have an innovative, 'hybrid' legal structure which safeguards our community purpose and social values but also includes a proportion of privately owned shares that allow for future investment. Our community interest purpose is to inspire, nourish, support, promote and bring together the community of social entrepreneurs, social innovators and social investors across public, private and civil society sectors. We aim to build the success of social business, to promote shared value, social responsibility and sustainability alongside entrepreneurship, innovation and business excellence. – To approach our subject matter with honesty, pragmatism (get real), good humour and with a sense of fun. Pioneers Post is built on over a decade of commitment to news, information and inspiration delivered first through Social Enterprise magazine, the world’s first magazine dedicated to social business, and then online through SocialEnterpriseLive.com. Social Enterprise was co-founded in the UK at the beginning of the new millennium by Tim West, now founding editor of Pioneers Post, in partnership with colleagues from the trailblazing magazine New Start, a cutting edge publication about economic and social regeneration, and with CAN, a major force for social enterprise support and growth in the UK. Over a decade, our website, weekly e-bulletin and Twitter feed have developed a loyal readership of tens of thousands of individuals and organisations committed to doing business that creates positive social and environmental change, reaching social entrepreneurs and innovators in 60 countries.